On the 10th August 1971 the BBC was already reporting on the killings in Ballymurphy from the previous day and stating that an eyewitness was “…putting the blame fairly and squarely on the British Army”. The BBC quickly became the subject of attacks by the British government for its reporting on the actions of the Parachute Regiment. The British Defence Minister Lord Carrington even accused the BBC of “sniping” at the British Army and indulging in propaganda. The BBC called it an “error of judgement”. On 9th August 1971, a neighbour of Fr Hugh Mullan, Bobby Clarke, was shot by soldiers after lifting a child to safety during the violence that followed the mass arrest of ‘Catholics’ that morning. After ringing the British Army HQ to advise them that he was going out to administer the last rites to Clarke, Fr Mullan ventured out, waving a white cloth and dressed as a priest, only to discover that Clarke was not fatally injured. He attempted to leave to get an ambulance for Clarke at which point he was shot by a British soldier. Frank Quinn, who attempted to provide assistance, was also shot dead. Coverage of Fr Mullan’s death included an interview with the local Catholic bishop, William Philbin, broadcast on BBC the next day. The same day Bobby Clarke was also interviewed on the BBC Radio 4 programme, World at One, where he gave an eye witness account of Fr Mullan being shot in the back by a British soldier. Reporting of Fr Mullan’s death in many of the British newspapers repeated the claim that he had been shot as he went to administer the last rites to a wounded gunman. After the items were broadcast the Conservative MP for Dorset South, Evelyn King, wrote to Lord Carrington accusing the BBC of irresponsibility and “sniping” at the Army. Obviously, the use of the word ‘sniping’ was deliberate as this was the term conventionally used by reporters when describing physical attacks on the British Army in the north. The intention was clearly to use the term to associate the views of the BBC with those that were actually ‘sniping’ at the British Army. This is pretty unsophisticated censorship in that it is intended to diminish future reporting critical of the British Army as merely ‘sniping’ from the BBC. Carrington responded to King’s letter by writing to the head of the BBC, Lord Hill, and King, stating that the radio interview in particular “…fell below the standard of fairness and accuracy people were entitled to expect” although he included other unspecified BBC items in his criticism. Carrington also seemed to be concerned that the items were also an attack on him personally since he had expressed his ‘utmost gratitude’ on the BBC for what the British Army had done. In his letter, Carrington admonished the BBC that when its “reporting falls below the standard of fairness and accuracy which we are entitled to expect, the main effect is to damage the corporation’s own standing with the public”. It should be borne in mind that, at this time in 1971, British public opinion on the deployment troops in the north wasn’t clear as there were calls for troops to be withdrawn both from the likes of the New Statesman and the National Front (see, eg, Irish Press, 24th August 1971). The latter even advocated Irish reunification, although it also wanted the forced repatriation of all Irish from Britain on the grounds that they were all mere “white wogs”. The BBC accepted Carrington and Kings criticism and stated that “We do not defend the use of the item on the shooting of Fr Mullan. In our view it was an error of judgement to use this part of the interview.” However the BBC did reject the overall criticism. While this may seem like another footnote to the broader issue of the behaviour of the parachute regiment in Ballymurphy between 9th and 11th August 1971, it points to one of the wider issues that is not yet satisfactorily addressed. The role of the media lies both in reporting events and ensuring that those in positions of responsibility are suitably held to account. This means it is critical to understand how the media subsequently reported on events and what influenced how the media framed their reporting. The potential chilling effect of criticism, such as came from Lord Carrington, is fairly obvious. The long term repercussions, though, are significant. A glaring omission from contemporary media coverage of ‘legacy’ cases involving individuals killed or injured by state forces is a clear articulation by the media of what differentiates these cases from other violent conflict deaths. For those unsure what that means: when a meaningful inquest or investigation of the circumstances has not occurred the default position is that the information given by the British Army (etc) becomes the official account of a death. Fr Hugh Mullan, like others killed by the state, is thus deemed as being culpable in his own death unless the British Army itself, or some legal process, formally recognises the killing was unjustified. It is solely victims of the state that are, in this way, deemed guilty until proven otherwise. The repeated failures to hold the state and its leading figures to account is one legacy of the real error in judgement of the BBC (and media in general) in allowing itself to become the propaganda tool of the likes of Lord Carrington. You can read a balanced item about Fr Hugh Mullan on the BBC here along with footage of the interview with the Catholic Bishop of Down and Connor, Dr William Philbin, on the day following his death (note the video may not work in every territory). The BBC admitted yesterday that its use of part of an interview on the death of a Roman Catholic priest in Northern Ireland was an error in judgement. BBC Radio 4’s The Word at One programme on August 10 carried an item on the death of a Roman Catholic priest, Fr Hugh Mullan, the day before. The item took the form of an interview with an unnamed Irishman who claimed to be the man to whom the priest was giving the last rites when he was shot. The man alleged that the priest had been shot in the back by a British soldier. But the Defence Secretary, Lord Carrington in letters to a Conservative MP Mr Evelyn King (Dorset S) and the BBC chairman, Lord Hill, has said that the item fell below the standard of fairness and accuracy people were entitled to expect. Mr King had written to Lord Carrington accusing the BBC of irresponsibility and “sniping” at the Army in its coverage of the Northern Ireland crisis. He then cited as an additional example, the item arising from the death of Fr Mullan and recalled that he had taken part in an interview on BBC Television News. But he was concerned about the instances cited. But the BBC reacted sharply to Mr King’s accusations of daily “sniping” and indulging in propaganda. At 8.30 am on Friday 15th January, 1943, Jimmy Steele, Paddy Donnelly, Ned Maguire and Hugh McAteer escaped from A wing in Crumlin Road. In a well planned escape they broke through the roof, descended a rope to the yard and then scaled the perimeter wall in the morning before it got light. Only for a prison officer, Lance Thompson’s, son raising the alarm after seeing McAteer (the last over the wall), a second official escape team of three men would have followed them at 9 am and then the escape route was open to any others that could make it after that. The escape caused a sensation and significant embarrassment to the northern government which offered a £3,000 reward for information leading to the capture of any of the escapees. 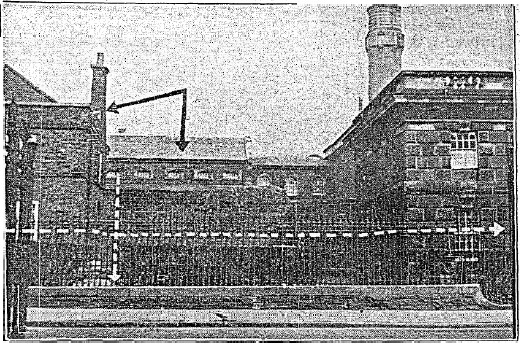 Details of the escape were published in Republican News in March 1943 and by Hugh McAteer in the Sunday Independent in 1951. Diagram from Hugh McAteer showing where the prisoners exited the roof (black down arrow), direction they came from, and where they scaled the front wall. Published in Sunday Independent, 22nd April 1951. This is the view from the same spot today (note that the outer wall has been raised in height since). The following Communique was issued from Northern Command Headquarters in the afternoon of 15th January 1943. In his 1986 biography, Harry. written with Uinseann MacEoin, Harry White mentions a poem about the escape published in the March 1943 Belfast edition of Republican News (which was edited by Jimmy Steele at the time, while on the run). I’ve not tracked down a copy of the March 1943 Belfast edition, but I found a poem in an undated issue of Rushlight magazine from the 1980s called The Daring Escape from the Crumlin Road Jail (which I’ve reproduced below). I suspect this is the same poem. The tone is correct for February/March 1943 as Ned Maguire was recaptured in Donegal on 22nd March (after assisting in the mass escape from Derry prison the day before). The poem may even be a first hand account, as internal details appear accurate, such as the escapees being named in the order in which they seem to have gone over the wall, as well as the line “it seemed like a dream“. The Daring Escape from the Crumlin Road Jail could have been written by Jimmy Steele himself as he published numerous self-penned poems and songs (and wrote much of that Belfast edition in March 1943). His work was published in newspapers and magazines that were banned under the infamous Civil Authorities (Special Powers) Acts (or expected to be banned), so author’s names were usually omitted. A brief list of publications he contributed to, or edited, from the 1930s onwards includes An Síol, Wolfe Tone Weekly, An tÓglach, War News, The Critic, Republican News (in the 1940s and again in 1970), Resurgent Ulster (also printed as Ulaidh ag Aiséirighe), Glór Uladh, Saoirse and Tírghrá. He also produced a number of publications for the National Graves Association in the 1950s and 1960s containing some poems and songs under his own name that were published anonymously elsewhere. I’m also pretty sure my granny (Jimmy’s sister-in-law) once told me that he also wrote Our Lads in Crumlin Jail. Billy McKee recalls that Jimmy wrote the original version of Belfast Graves to which verses were later added (and lines from which feature in Brendan Behan’s play Borstal Boy). The Daring Escape from the Crumlin Road Jail was also popularised as a song. My mother remembers that it was sung to the tune of The Old Orange Flute (I’ve linked a version recorded by The Dubliners). The melody used for The Old Orange Flute is really just an archetypal music hall standard also used for Six Miles from Bangor to Donaghadee (the link is a recording by Richard Hayward from 1948). The versions of The Old Orange Flute by The Dubliners and The Clancy Brothers from the 1970s incorporated lines from both songs. 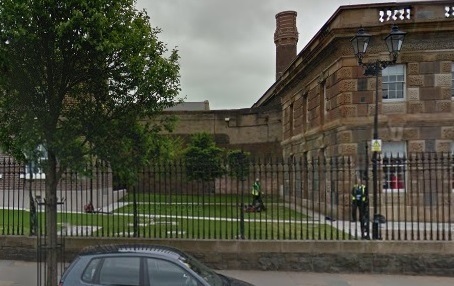 I’ve inserted breaks in the lines of The Daring Escape from the Crumlin Road Jail to create verses that match The Old Orange Flute’s phrasing since it is a better fit. The premise of The Old Orange Flute – a dystopia where inanimate objects acquire political agency all of their own, is found in at least one other comic song – The Fenian Record Player. I’m sure there are others, too. I’ve reproduced the poem below as it appears in Rushlight. The punctuation doesn’t fit the verses when put to the melody of The Old Orange Flute which does seem to be consistent with it originating as a poem. There is one error – the reward was £3,000 not £500 – and one spelling mistake – ‘dispair’. Obviously, the punctutaion and errors may have been faithfully reproduced, or originated, in Rushlight. There may have been other verses written about this particular escape, but I’ve not come across any others to date (or the March 1943 Belfast edition of the Republican News). When four Irish rebels broke all Prison law. When they heard that the fourth lad was Hugh McAteer. Of how four Irish rebels broke out of his Jail. But the search it was useless … the rebels are free.